Written beautifully, Because he is… is a must read for Bollywood fans, Urdu lovers and young parents! Because he is… brought out by HarperCollins is a warm and amazing book on a father/daughter relationship. The book was first published in 2004 and this new edition brings you up to date with all of Gulzar’s subsequent films, poems, writings and reliving his life with his grandchild Samay. 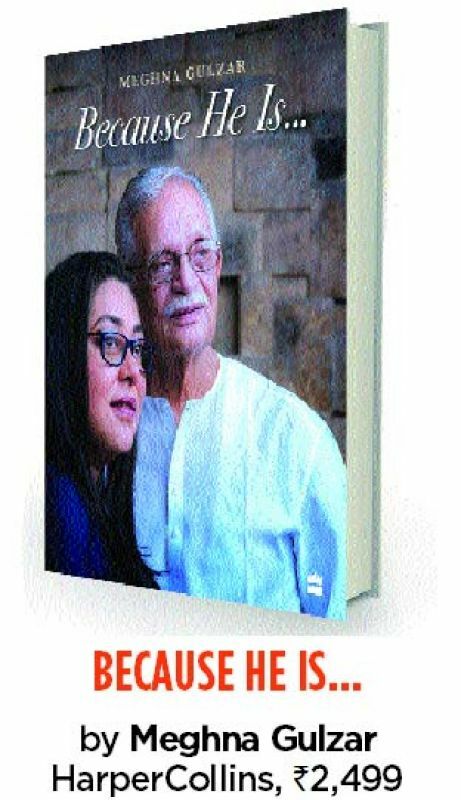 Gulzar is a celebrity in Bollywood and in the world of arts and literature, his daughter Meghna, who has written the book, is also spreading her wings to that exalted status. The book however, is down to earth, a beautiful narration of an abiding, tender and nurturing relationship between a young girl growing up in tinsel town and her doting father. Peppered with photographs, anecdotes about dad’s close film world friends and with snippets of Gulzar’s poems, this is a book that every parent should read to learn about parenting. “Gulzar” for the world was Papi for Bosky, the pet name she grew up with. 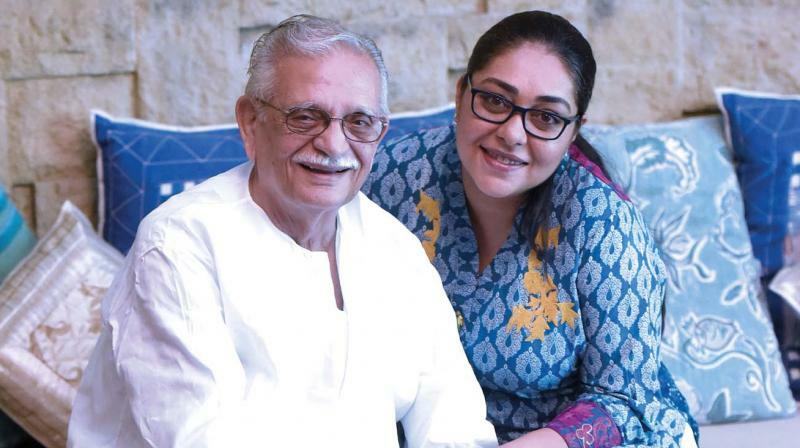 Though Gulzar and his equally celebrated actor wife, Rakhee, separated when Bosky was very young, they were always there for her, sharing time and guiding and steering her through life. When living with Papi, Meghna would wake up to the sound of the sitar being played early morning by her father. For him, defeating the sun was a great way to start a day. He wrote a book for her every birthday till she was 13. He would help her tie the shoe laces till she mastered the art. He would also tie her school sash making an artistic double knot but the biggest challenge was plaiting her hair. Since she was never happy with the way the ayah braided it, he took on the responsibility following his daughter’s instructions… first parting the hair down the middle, then dividing it in three equal portions… to get the perfect, straight plait. He said it was wrong of parents to presume that they know better, or know more than their child. They may be biologically older than their child, but in their experience as parents, they’re of the same age. 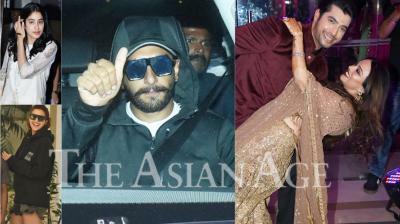 So if Meghna was his two-year-old daughter, he was her two-year-old father. And they were both. Learning, evolving together — as father and daughter. So he took great pleasure in braiding her hair. He says it reminded him of how his father used to braid his hair when he was a young boy. Few people know that Gulzar, born to Sardar Makhan Singh Kalra and Sujaan Kaur and named Sampooran Singh Kalra, was a Sikh. Born in Dina village of Jhelum in Pakistan, he moved with his parents to Delhi before Partition. An egalitarian, Gulzar showed his daughter half a dozen nursery schools so that she could decide which to go to. During her school years he made it a point to be back from work at 4 pm, the time her school got over. Both surrounded themselves with books and each had their own canvas to draw and paint. This care in upbringing was extended to the grandchild, ensuring that a member of the family — father, mother or grandparents — was always there for him. This may be because Gulzar’s own early life was disturbed. His mother died when he was young and Partition had left their scars on his mind. As the Delhi home overflowed with relatives from Pakistan, in 1949 he was moved to Bombay to be with his eldest, well-settled brother. Meghna shows facets of his filmy world intertwining it with her own growing up. In the ’60s, ’70s and ’80s, it was not all glamour and high life but gentle, enduring friendships with directors, writers, music composers and men of literature. Gulzar’s love for poetry and writing became evident even when he was in school where he would participate in bait baazi or antakshri. In Bombay he was attracted to the left-leaning Indian People’s Theatre Association and the Progressive Writers Association where he met people like Ali Sardar Jafri, Kaifi Azmi, Krishan Chander, Sahir Ludhianvi and Faiz Ahmed Faiz, whose works he had read and admired. He also became a part of the Punjabi Sahitya Sabha, where he struck a friendship with writers Gurvel Singh Pannu, Rajinder Singh Bedi, Sukhbir, actor Balraj Sahni and others. 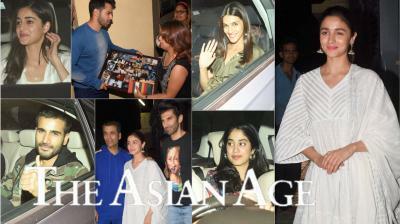 It was at the Indian National Theatre’s rehearsals that he met Sanjeev Kumar, a 23-year-old playing the role of an old man in an Ibsen play, and they became close friends. A few years later he took Sanjeev Kumar in several of his films, often as an old man — Parichay, Koshish and Mausum. He also met the famous music composer Salil Chowdhury and lyricist Shailendra during a performance of the Bombay Youth Choir. He even worked in a garage for several years till he met a friend from Delhi — Jhalani — and through him Debu Sen, assistant director to legendary filmmaker Bimal Roy. Shailendra, the original lyricist for film Bandini had fallen out with its music director S.D. Burman, and Debu Sen introduced Gulzar to the filmmaker. Bimal Roy, who, mistaking took him for a Muslim because of his name Gulzar, doubted his ability to write Vaishnav poetry. When told that he was a Bengali knowing Sikh, he was asked to script the words for a song and thus was born Gulzar’s first song Mora Gora Ang Lei Le. However, Burman and Shailendra resolved their differences and Shailendra was back as lyricist for the film. In 1960, Bimal Roy persuaded Gulzar to join him as an assistant director. Gulzar blossomed in directing, writing scripts and songs under Bimalda’s guidance. It was on the sets that he met Meena Kumari, who became another great friend for whom he observed the Ramzan fast when she could not and continued observing it even after her death. Hemant Kumar, Tarun Majumdar, Salil Chowdhury, Debu Sen, Mukul Dutt, Basu Bhattacharya and others were a part of Gulzar’s everyday circle and like them, for a short while, he wore a dhoti with his starched white kurta. Bimalda’s death in 1965 left him shattered but he joined Hemant Kumar and worked with him for Bawarchi, Guddi, Namak Haram, Anand and Ashirwad. It was at Hemant Kumar’s home that he met Rakhee. Their marriage was brief and their careers peaked around the same time but the lasting outcome of the marriage was Bosky. Mere Apne, the first of Gulzar’s films, directed by Romu Sippy, released in 1971 was critically acclaimed and a commercial hit. The same year Gulzar got the Filmfare award for the best dialogues in Anand. He met actor Jeetendra and R.D. Burman, who became another close friend, and the film Parichay was the outcome. In 1976, Gulzar started his own film company, Meghna Movies, so that he could continue to make his kind of films. The book gives glimpses of actors, actresses, singers and cinematographers and behind the scenes activity of the filmy duniya. The collaboration with Vishal Bhardwaj, after the death of R.D. Burman, led to the making of Maachis and the heart-stopping number Chappa chappa charkha chale could be heard in paan shops and discotheques. He had a special relationship with Tabu, the Maachis actress, and the boxer dog that Govind and Meghna bought for Gulzar was named Pali, after Chandrachur Singh’s character in Maachis. At 23, Meghna had found her life partner Govind Singh Sandhu and her parents began to know and like him. After 1999, Gulzar did not want to direct films but his creativity found expression in other forms. He wrote songs for over 50 films in 15 years — Bunty Aur Babli, Omkara, Slumdog Millionaire, Ishqiya, Guru, Kaminey, Haider and Mirzya. With musical talent like Amjad Ali Khan, Ustad Ghulam Ali, Sufi singer Abida Parveen, Rekha and Vishal Bhardwaj and Bhupinder Singh, he made non-film albums, including “Gulzar in conversation with Tagore” (2016), a collection of Tagore’s songs and poems, translated and narrated by him, composed by Shantanu Moitra and sung by Shaan and Shreya Ghoshal. Gulzar still says, “There are more than a hundred books in my head.” In 2017 his first books in Bengali were published.